As in other fields of engineering, education in soft materials engineering for robotics and wearables must provide a balance between practice and fundamentals of applied science. Students must learn how to select or engineer materials that satisfy a broad range of demands related to mechanical performance (e.g. low elastic modulus, high strain limit, limited inelasticity), electrical and thermal performance (high permittivity or conductivity, low breakdown), biocompatibility (non-toxic), and scalable processibility (printable, moldable). In order to order to engage in safe and comfortable contact with the human body, machines and electronics must match the mechanical properties of soft biological tissue. Rather than using rigid plastics, metals, and ceramics, these human-compatible technologies must be primarily composed of soft condensed matter. These include integrated systems of fluids, elastomers, and colloidal suspensions that function as elastically-deformable circuits, sensors, actuators, and rigidity-tuning elements. 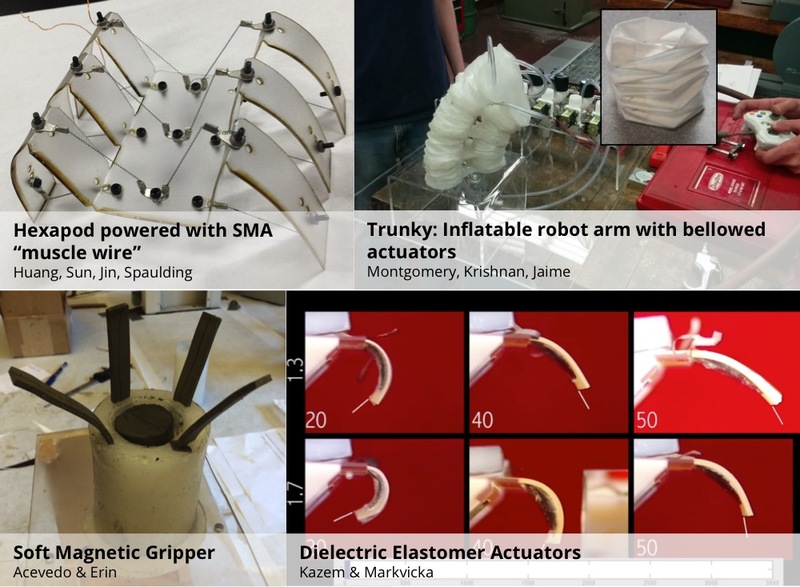 The course also contains a project component in which students propose and implement a novel approach to soft robotics actuation, sensing, or electronics.